Last Thursday, it was cocktail o’clock for the Lucid UK team in celebration of the company’s 10th birthday! 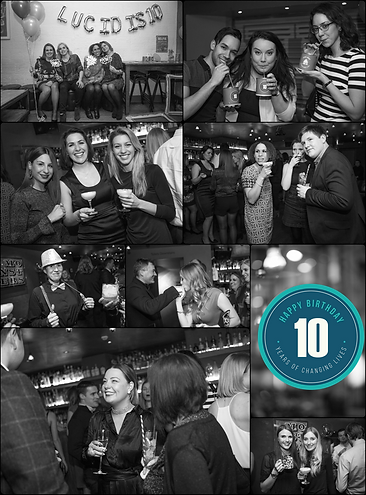 With live saxophone music and bespoke drinks, Lucid Group toasted to 10 exceptional years of changing lives though pioneering medical education. Celebrations in the US office followed this Wednesday, with a smaller crowd but certainly no less exuberant. Since its conception in 2007, Lucid has grown from its two co-founders, Dennis O’Brien (CEO) and Jan Steele (COO), to more than 100 employees in four offices across the UK and USA. Over the past 10 years, the agency has delivered over 3,000 behaviour-change programmes, reached over 50,000 healthcare providers worldwide, and changed over 25 million patients’ lives. Numerous Communiqué Awards and PMEA Awards speak to the far-reaching success of Lucid’s approach. However, Lucid’s work is not done yet. In the coming months and years, the agency is planning to rollout brand new tools to widen the reach and measure the impact of their initiatives, which will help to create even more precisely tailored programmes. With that in mind, cheers to the next 10 years of changing patient’s lives through medical education!